Probiotics are live active cultures thought to promote intestinal health. They're found in a variety of foods, most notably traditional yogurts, but kids often miss out on their benefits due to persnickety tastes or food allergies. 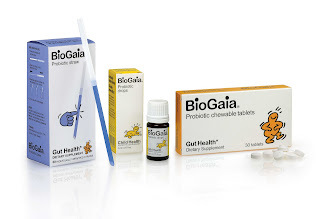 BioGaia offers a range of probiotic products that are specifically designed for kids in easy-to-take forms like straws, chewable tablets and drops that can be mixed into bottles or food. For more information on BioGaia Children's Probiotic Products, check them out on Facebook or YouTube or Twitter. To enter and win your choice of BioGaia Children's Probiotic Products (Drops, Straws or Chewable Tablets), please comment on this post with which you would be most likely to use. Feel free to share your bad tummy stories, too! Entries will be accepted through May 12th and I'll pick the winner using Random.org. US readers are eligible. Disclosure: I received samples of the products mentioned for this review, thanks to BioGaia and MomSelect. SoJo likes the straws, or at least doesn't detect anything weird about them (I won some on Twitter). I'll have to check out the tummy pills too. My 18M loves straws - so I'd pick those! I would pick the straws. I'd love to use the drops.